18 U.S. Code § 43 - Force, violence, and threats involving animal enterprises (Animal Enterprise Terrorism Act (AETA) - The statute covers any act that either "damages or causes the loss of any real or personal property" or "places a person in reasonable fear" of injury. Gives the U.S. Department of Justice greater authority to target animal rights activists. The AETA does so by broadening the definition of "animal enterprise" to include academic and commercial enterprises that use or sell animals or animal products. It also increases the existing penalties, includes penalties based on the amount of economic damage caused, and allows animal enterprises to seek restitution. A Voice for Elephants - Elephants are increasingly endangered by a growing human incursion into their habitats. Poaching has drastically exacerbated the plight of the African elephant in particular. A National Geographic resource for information, a forum for discussion. Alliance for the Wild Rockies (AWR) - Formed to meet the challenge of saving the Northern Rockies Bioregion from habitat destruction. American Society for the Prevention of Cruelty to Animals (ASPCA) - Exists to promote humane principles, prevent cruelty and alleviate fear, pain and suffering in animals. American Veterinary Medical Association (AVMA) - Association representing more than 69,000 veterinarians working in private and corporate practice, government, industry, academia, and uniformed services. 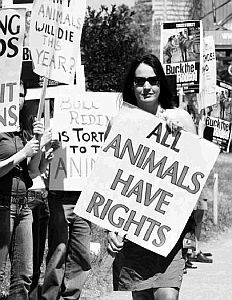 Animal Aid - UK's largest animal rights group and one of the longest established in the world, founded in 1977. Campaigns against all forms of animal abuse. Animal Legal Defense Fund (ALDF) - The leading U.S. animal rights law organization working nationally to defend animals from abuse and exploitation. 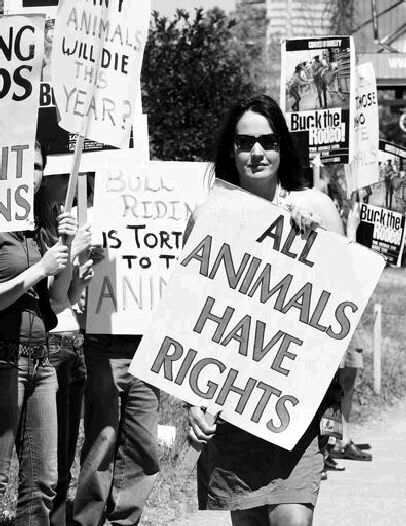 ALDF's network of over 750 attorneys is dedicated to protecting and promoting animal rights. Animal News Center (ANC) - Reporting the news from the world of animals. Current information about pets, wildlife and all other animals. Animal Protection of New Mexico (APNM) - Advocating for animals by effecting systemic change, working towards the humane treatment of all animals. This includes active support of local and state legislation towards the prevention of animal cruelty, as well as public awareness campaigns designed to teach students and communities across New Mexico about the ongoing threats to animals. Animal Rights: The Abolitionist Approach - An approach to animal rights that (1) requires the abolition of animal exploitation and rejects the regulation of animal exploitation; (2) is based only on animal sentience and no other cognitive characteristic, (3) regards veganism as the moral baseline of the animal rights position; and (4) rejects all violence and promotes activism in the form of creative, non-violent vegan education. Animal Welfare Act and Regulations - The Animal Welfare Act was signed into U.S. law in 1966. While its original intent was to regulate the care and use of animals in the laboratory, it has become the only Federal law in the United States that regulates the treatment of animals in research, exhibition, transport, and by dealers. Other laws, policies, and guidelines may include additional species coverage or specifications for animal care and use, but all refer to the Animal Welfare Act as the minimum acceptable standard. Animal Welfare Approved (AWA) - Seeing the AWA seal on meat, dairy and egg products gives consumers a way to identify products which come from humane farming systems, and it gives farmers a way to show their customers how they farm. This certification and other technical and marketing services is offered to farmers at no charge. Because AWA is not financially dependent on farmer fees, it is able to remain unbiased and transparent in its auditing and certification. Find AWA-aproved farms and products in your area. Animal Welfare Institute (AWI) - Animal protection and education. Founded in 1951 to reduce the sum total of pain and fear inflicted on animals by humans. AnimalConcerns - Online community for people concerned about the welfare and rights of animals. News, feature articles, general information and resources, government resources, actions. AnimalLaw - provides access to legislation and legal matters pertaining to the rights and welfare of animals. Animals Used for Fur - Information on the fur industry and its practices, impact on animals, actions and boycotts, and other fur news. Animals Voice - Information, news, campaigns, boycotts, action alerts, editorial and photography about animal rights and its defenders. Association for Assessment and Accreditation of Laboratory Animal Care (AAALAC) - Promotes the humane treatment of animals in science through a voluntary accreditation program. - Protecting the last wild buffalo. Born Free USA - Fights animal abuse and exploitation. Buffalo Field Campaign (BFC) - Working both in the field and in policy arenas to stop the harassment and slaughter of America's last wild buffalo. Center for Biological Diversity - Works through science, law, and creative media to secure a future for all species, great or small, hovering on the brink of extinction. Center for Captive Chimpanzee Care - In the 1950s, the Air Force established a colony of chimpanzees captured from the forests of Africa to serve in the U.S. space program. After showing the "right stuff" the chimpanzees were reassigned to serve as biomendical research subjects where they remain today. Some of the survivors and descendants of the original colony have a chance at a very different future. The Center for Captive Chimpanzee Care was established in 1997, under the leadership of Jane Goodall and Roger Fouts, to create a sanctuary where chimpanzees could live out the remainder of their lives in the best environment possible. The Center has been awarded custody of 21 of the Air Force chimpanzees. Center for Marine Conservation - Dedicated to protecting marine life in all its abundance and diversity. Coalition to Abolish the Fur Trade (CAFT-UK) - Grassroots organization dedicated to saving animals who would otherwise be slaughtered and skinned for nothing more than human vanity. Committee on Recently Extinct Organisms (CREO) - In collaboration with scientists from around the world, CREO has developed standardized criteria for analyzing extinctions that can be applied across diverse taxonomic groups. CREO is now in the process of organizing efforts to collect extinction data and analyze them against these criteria so that an accurate and comprehensive survey of recent extinctions can be produced. Convention on International Trade in Endangered Species of Wild Fauna and Flora (CITES) - An international agreement between Governments. Its aim is to ensure that international trade in specimens of wild animals and plants does not threaten their survival. Also see Wikipedia. CREO Extinctions Database - Consists of lists for extinctions of mammals and fishes since AD 1500. Prepared by the Committee on Recently Extinct Organisms (CREO). Elephant Sanctuary - The Elephant Sanctuary of Hohenwald, Tennessee is a natural-habitat refuge where sick, old and needy elephants can once again walk the Earth in peace and dignity. The Elephant Sanctuary supports a bill to prevent circus elephants from performing in Tennessee. EcoHealth Alliance - A wildlife conservation organization that works worldwide to save endangered species from extinction through collaborative projects with local conservationists. Farm Sanctuary - Founded in 1986 to combat the abuses of factory farming and encourage a new awareness and understanding about farm animals. Today, Farm Sanctuary is the nation's largest and most effective farm animal rescue and protection organization. Farm Sanctuary has rescued thousands of animals and cared for them at its sanctuaries in Watkins Glen, New York; Northern California (Orland); and the Los Angeles area. FDA: Animial and Veterinary - Regulates the manufacture and distribution of food additives and drugs that will be given to animals. These include animals from which human foods are derived, as well as food additives and drugs for pets. Also covers isues of animal cloning, Bovine Spongiform Encephalopathy (BSE), and Animal Drug User Fee Act of 2003 (ADUFA). Fund for Animals, The (The Fund) - With regional offices working around the country on animal advocacy campaigns and animal care facilities such as the world-famous Black Beauty Ranch, The Fund is one of the largest and most active organizations working for the cause of animals throughout the world. Fund for the Replacement of Animals in Medical Experiments (FRAME) - FRAME considers that the current scale of animal experimentation is unacceptable. It also recognises that immediate abolition of all animal experiments is not possible. Its long-term goal is the total elimination of laboratory animal use, through the development, validation and acceptance of replacement alternative methods. Until this goal is reached, it also supports efforts to reduce the numbers of animals used through better science and better experimental design, and to refine procedures so that the suffering of any animals necessarily used is minimised. Golden Gate Audobon - A volunteer-oriented organization dedicated to protecting Bay Area birds and other wildlife. Great Ape Project International - Founded to work for the removal of the nonhuman great apes from the category of property, and for their inclusion within the category of persons. Green Is the New Red - Focuses on how fear of 'terrorism' is being exploited to push a political and corporate agenda, and particularly on how animal rights and environmental advocates are being branded 'eco-terrorists' in what many are calling the Green Scare. GreenScare - The term Green Scare refers to the federal government's expanding prosecution efforts against animal liberation and ecological activists, drawing parallels to the Red Scares of the 1910's and 1950s. It comprises the tactics that the US government and all their tentacles (FBI, IRS, BATF, Joint Terrorism Task Forces, local police, the court system) are using to attack the Earth Liberation Front and Animal Liberation Front and those who publicly support them. Grizzly Times - Protecting grizzly bears. Humane Association of Wildlife Care and Education (HAWKE) - Dedicated to saving hundreds of birds, mammals and reptiles each year. Humane Farming Association (HFA) - HFA's goals are to protect farm animals from cruelty, to protect the public from the dangerous misuse of antibiotics, hormones, and other chemicals used on factory farms, and to protect the environment from the impacts of industrialized animal factories. Humane Society of the U.S. - The world's largest animal protection organization, encompassing nine regional offices; five affiliates; an international arm; 250 staff members, including veterinarians, wildlife biologists, lawyers, animal behaviorists, and other professionals; and seven million members and constituents. It helps animals by advocating for better laws to protect animals; conducting campaigns to reform industries; providing animal rescue and emergency response; investigating cases of animal cruelty; and caring for animals through its sanctuaries and wildlife rehabilitation centers, emergency shelters and clinics. International Fund for Animal Welfare (IFAW) - Works to improve the welfare of wild and domestic animals throughout the world by reducing commercial exploitation of animals, protecting wildlife habitats, and assisting animals in distress. International Marine Mammal Project - Working to make oceans safe for marine mammals worldwide. A project of Earth Island. International Primate Protection League (IPPL) - Working for the well-being of primates. IPPL has field representatives in 31 countries. Its advisory board is composed of experts from the fields of zoology, anthropology, medicine, biology, veterinary medicine, and psychology. Many IPPL officers live for long periods with primates in their natural habitats. International Union for Conservation of Nature and Natural Resources (IUCN - World Conservation Union) - Assisting societies throughout the world to conserve diversity in nature. The World Conservation Union brings together States, government agencies and a diverse range of non-governmental organizations in a unique world partnership: over 980 members in all, spread across some 140 countries. Also, see the IUCN Red List of Threatened Species. Jane Goodall Institute - Works to increase primate habitat conservation and to expand non-invasive research programs on chimpanzees and other primates. LAGA - The Last Great Ape organization (LAGA) was born because the survival of Africa's great apes demanded urgent action. Operates in Cameroon. It focuses on threatened species and mainly on the dealers, the primary generators of the illegal bushmeat business, the ivory trade and the pet trade. Mercy for Animals - Dedicated to preventing cruelty to farmed animals and promoting compassionate food choices and policies. Mule Deer Foundation - Purpose is to ensure the conservation of mule deer, black-tailed deer and their habitat. National Audobon Society (NAS) - Mission is to conserve and restore natural ecosystems, focusing on birds and other wildlife for the benefit of humanity and the earth's biological diversity. National Wildlife Association (NWA) - Conservation group, uniting individuals, organizations, businesses and government to protect wildlife, wild places, and the environment. New England Anti-Vivisection Society (NEAVS) - A Boston-based, national animal advocacy organization dedicated to ending the use of animals in research, testing, and science education. Through research, outreach, education, legislation, litigation, and policy change, NEAVS advocates for replacing animals with modern alternatives that are ethically, humanely, and scientifically superior. No Compromise - Militant, direct action newspaper of grassroots animal liberationists and their supporters. North American Primate Sancturary Alliance (NAPSA) - Founded in 2010 by the directors of seven of the leading chimpanzee sanctuaries on the continent. The mission of NAPSA is "to advance the welfare of captive primates through exceptional sanctuary care, collaboration and outreach." Founded in 2010 by the directors of seven of the leading chimpanzee sanctuaries on the continent. Chair Lesley Day of Chimps, Inc.
Oceania Project, The - Education and research organization dedicated to raising awareness about Cetacea (whales, dolphins and porpoises) and the ocean environment. Organization for Bat Conservation - Mission is to educate people about bats and inspire them to become actively involved in conservation. Chengdu Research Base of Giant Panda Breeding - In order to rescue and protect the endangered giant panda species, the Chengdu Research Base of Giant Panda Breeding was established in March 1987 with the mission to further the research and conservation carried out by the Chengdu Zoo. With the aim of promoting Chengdu as "The Home Land of The Giant Panda," the Chengdu Zoo has worked tirelessly since the 1950s. Now the Chengdu Panda Base has taken up the causes of research, breeding, and conservation among the giant panda population. The Base's geographic location and excellent technological and professional resources allow it to carry out the ex-situ (off-site) conservation efforts and to improve the artificial reproduction procedures to increase the giant panda population. When population levels have reached desired levels, the Chengdu Panda Base will shift its efforts toward helping giant pandas adapt to their natural habitats so can be released into the wild and repopulate their native homeland. Giant Panda Conservation Fund - Helping the Smithsonian Natioanl Zoological Park tosave giant pandas from extinction by bringing Tian Tian and Mei Xiang to the Zoo, creating a new state-of-the-art exhibit for them, and financing a variety of research projects and other important activities in China and the United States. People for the Ethical Treatment of Animals (PETA) - Operates on the principle that animals are not ours to eat, wear, experiment on, or use for entertainment. PETA focuses on areas in which the largest numbers of animals suffer the most intensely for the longest periods of time: on factory farms, in laboratories, in the fur trade, and in the entertainment industry. It also works on a variety of other issues, including the cruel killing of beavers, birds and other "pests," and the abuse of backyard dogs. Piikani Nation Treaty - In 2013 the BC Assembly of First Nations passed a resolution calling for a ban on trophy hunting grizzly bears. The Assembly cited articles from the UN Declaration on the Rights of Indigenous People (UNDRIP) to demonstrate the moral and political force of the First Nations' position. U.S. President Barack Obama supports the UNDRIP, yet his Administration is failing to abide by it. Primate Freedom Project - Dedicated to ending the use of nonhuman primates in biomedical and harmful behavioral experimentation. Royal Society for the Prevention of Cruelty to Animals (RSPCA) - The RSPCA's influence covers the whole range of animal protection. The Society is involved in practical welfare, law enforcement as well as high-profile campaigning and education. It employs veterinary experts and consultants in the care and treatment of farm livestock, wildlife, domestic pets and animals used in research. Satya - A magazine of vegetarianism, environmentalism, and animal advocacy. Save Japan Dolphins - A campaign conducted by the International Marine Mammal Project of Earth Island Institute, formed to put an end to the Japanese drive fishery slaughter of dolphins and stop the capture and live trade of dolphins to zoos and aquariums around the world. Save the Elephants - Conducts vital research on elephant behaviour and ecology. Pioneered GPS radio tracking in Africa to provide insight into the life of elephants. Also assists in implementing a UN-level program to monitor the illegal killing of elephants. Saving Our Resources Today (SORT) - Provides a direct link between individuals and organizations working on environmental and animal welfare issues. Sportsman for Fish and Wildlife (SFW) - Dedicated to the perpetuation of wildlife; passionate about hunting. Stop Huntingdon Animal Cruelty (SHAC) - Working to expose animal abuse at Huntingdon Life Sciences (HLS) facilities located in the USA and in the UK. Wildlife Habitat Council - Group of corporations, conservation organizations, and individuals dedicated to protecting and enhancing wildlife habitat. World Animal Net (WAN) - The world's largest network of animal protection societies with over 1,500 affiliates in more than 80 countries campaigning to improve the status and welfare of animals. World Society for the Protection of Animals (WSPA) - WSPA has offices in nine countries and over 200,000 individual supporters. It is the world's largest network of animal protection specialists having a membership of over three hundred animal protection societies in seventy one countries. The society is represented on numerous international bodies and is the only animal welfare organization to have consultative status at the United Nations and the Council of Europe. World Wildlife Fund (WWF) - Dedicated to protecting the world's wildlife and wildlands. Also, see the WWF's Annual Report. This webpage last updated on Saturday, September 9, 2017 11:46 AM.